Dekton, according to the company, is a sophisticated blend of raw materials which are used to produce the very latest in glass and porcelain as well as the highest in quartz work surface quality. In the CEO’s interview with Consumer Reports, he simply described the counters as a combination of glass, porcelain and quartz, making it a hybrid of the best materials available on the market today. Employing what is known as Sinterized Particle Technology, this process represents an accelerated version of the metamorphic change natural stone undergoes when in high temperatures and pressure over thousands of years. In general, you will not find the exact prices on the official Dekton website, but according to many third-party sources we found online, which we will source below, we found the average costs, when a professional installer was chosen, was in the $60 to $100 per square foot range installed. This price will greatly depend on the contractor you hire, the scope of the project, how many cutouts you need, the retailer you purchase the countertops from and your geographical region. As for the parts, when we talked to a countertop expert, who wished to remain anonymous, he stated the materials can be based on the colors, with the first level averaging $30 to $40 a square foot, with the premium levels retailing closer to $75 depending on the colors. With so many factors that can affect the price, we do recommend you compare quotes via the free comparison tool, HomeAdvisor.com. With this service, you can explain your job, and with this information, locally and licensed contractors will contact you with a quote. No credit card is needed and you can receive multiple quotes within 24 hours. A few members talked about what they paid for their Dekton countertops on this Houzz.com thread, with one member stating he paid $75 per square foot installed, while another said they were quoted close to $100 per square foot in New York City. Cuts and/or holes: How many cuts and/or holes will you need installed? For any countertop install, plan on budgeting at least $100+ per cut off. Seams: Are you able to install the entire countertop in one slab without a seam? If so, you can skip this factor; however, if more than one slab is required, then strategically installing the second slab to hide the seam can increase the costs. Colors and pattern: The company does offer a variety of colors and patterns, with each varying in pricing as mentioned above. Thickness: The thicker you want the slab to be, the more you should be prepared to spend. The company does offer thicknesses ranging from eight to 30 millimeters. Tear out: If you have an existing countertop, then most contractors will charge a disposal fee, often in the hundred+ dollar range. In the Consumer Reports study mentioned prior, they did find the counters, when compared to other brands, was great at resisting staining, cuts, heat and abrasions. Home Depot, as per its review, noted it is complete scratch resistant and cannot be stained or scorched. It’s known to stand up to UV rays, making it ideal for an outdoor project. Unlike many counter materials, such as granite and marble, it doesn’t need to be sealed. In terms of price, as you can see from the price quotes above, it’s much less than comparable counter materials such as granite, quartzite, quartz and marble. In fact, according to Apartment Therapy, the costs of Dekton counters installed can be less than just these comparable counter materials. Aside from countertop material, it can be used as siding or floor, to name a few. The company, as long as the counters were professionally installed, do offer a great 25-year warranty. With the average slab size measuring 126” x 56”, it is usually large enough to cover your entire countertop area without the need for a seam. In the same Consumer Reports study above, they did find that the Dekton counters, in comparison to the other countertops it tested, would chip on its edges when heavy objects were dropped on it. It isn’s the cheapest option on the market as laminate and concrete can be a cheaper option for homeowners. The counters must be professionally installed to take advantage of the warranty offered by the company. In terms of availability, it’s limited in terms of retailers, with Home Depot being one of the only bigger retailers carrying it. Some people do claim the edge styles are limited with certain textures and patterns. According to the official website, the company has more than 40+ colors available, with samples of each found here. Most of the colors, as you can see through the link, tend to be earth, without many “loud” color options available. As for the texture finish, the company offers a few choices, including matte, glossy, oxide, slate, bush hammered and leathered, and each finish type can vary depending on the color you decide to go with. As mentioned in the “cons” section, the edge styles are limited, but choices include chamfered, half bullnose, full bullnose, decorative beveled, standard square and mitered profeils. In some cases, however, some of these edged styles may not work with a surface you’re looking to purchase. As the colors do extend through the entire slab but not the texture and pattern itself, the edges may not be present with certain cuts and patterns. 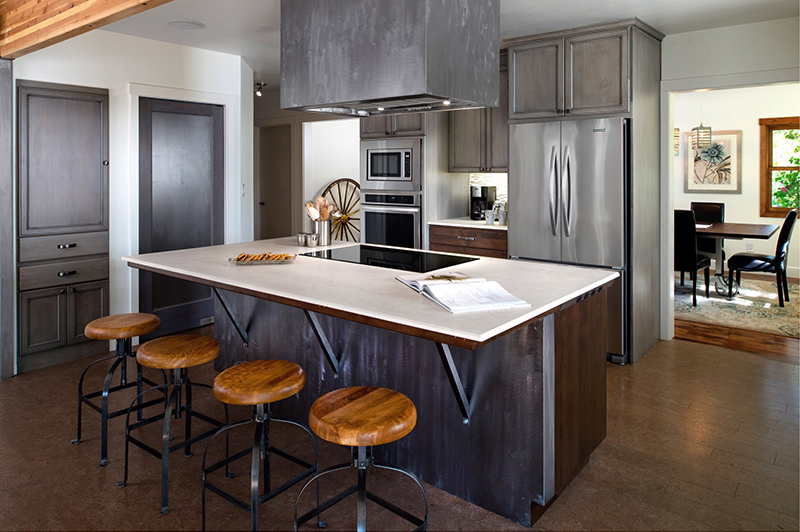 Dekton vs. Quartz — the difference? Quartz is known to be resistant to stains, while Dekton is considered stainproof. Quartz is vulnerable to heat, while Dekton is not. Quartz, over time, can begin to discolor when it’s exposed to the sun, while Dekton is considered UV-proof. In most cases, Quartz shouldn’t chip, but as mentioned in the cons above, Dekton counters can chip with enough force. Quartz, for just the material, can average $80 a square foot uninstalled, while Dekton can be in this price range… installed. Home Depot, being the largest retailer that carries the brand, offers small 4-inch-by-4-inch samples for $10. If you do not want to commit to the samples, you can also see the samples in person at a local Home Depot location. Thickness options range from 8 to 30 millimeters thick.